A peer conference has a coherent structure with a beginning, a middle, and an end that are designed to facilitate meaningful and useful connections and interactions. The first session of a peer conference, The Three Questions, serves three broad purposes. First, it defines and models an active, interactive, and safe conference environment. Second, The Three Questions provides a structured forum for attendees to meet and learn about each others’ affiliations, interests, experience, and expertise. And third, the session uncovers the topics that people want to discuss and share, as well as indicating the level of interest in each topic. The Three Questions provide a structured, safe way for attendees to learn about each other early in the conference. During the session, people discover topics that interest others. They get a sense of the depth of interest in these topics, and they find out who has experiences that they want to connect with and explore further. At a conventional conference, people meet and learn about each other slowly, mostly outside the programmed sessions. The Three Questions introduces every attendee to every other participant, right at the start of the event. (Peer conferences with more than sixty attendees use multiple simultaneous sessions of The Three Questions.) Hearing a little about each person present makes it much easier to introduce yourself to anyone with whom you share a particular interest. Regular conferences imply a hierarchy of participant expertise, where some people are presenters at sessions, and the others are not. This difference is enshrined in the conference program for all to see. During The Three Questions, every person is given the same amount of time to share with other attendees. This flattens the initial conference hierarchy as it implies that any attendee may possess something of value for their peers, allowing the conference process itself to uncover what experiences are of value to the people present. By not making assumptions, either about what content is of value or about who has valuable content to share, The Three Questions provides a safe environment for the participants to express and explore what is truly of value to them. The practical result of this approach is remarkable: valuable topics are uncovered and valuable participants discovered that were simply unknown to the conference organizers. I have seen this occur at every session of The Three Questions I have facilitated. Finally, asking every attendee to share during The Three Questions has a profound effect. I’ve found that the simple act of starting a conference with structured group sharing provides a powerful, infectious model of interaction to attendees and creates an intimate atmosphere that is rarely experienced at a traditional conference. Most group introductions, when they occur, are of the form “My name is John Smith and I work at MegaCorp.” In contrast, the question How did I get here? provides a safe way to uncover whatever each attendee chooses to reveal about their connections to the other participants. An attendee might say “I drove from Springfield on I-89” or “Fred, who I work with and who came last year, told me this was a great conference” or “When I came to this conference two years ago, I discovered I was not alone.” Often, attendees say a great deal more. This question allows participants to learn more about their fellow attendees, and, in the process, begin to form ideas about who they may want to spend time with during the rest of the conference. “How has your organization decided on Acceptable Use Policies”? Topics mentioned by attendees are recorded onto flip-charts, whiteboards, or a projected Google Doc by two scribes. The resulting lists are displayed at peer session signup, and they also serve the purpose of reassuring each attendee that their concerns and interests have been heard and captured for the group. What Experience Do I Have That Others May Find Useful? The answers to this question uncover experiences or expertise unknown to the conference organizers, experience that has been of great worth to attendees. I have seen casually mentioned topics evolve into completely unpredicted rave conference sessions (in one case, a session that everyone at the conference attended.) And at a more intimate level, I have seen someone discover the one other person at the conference who knows exactly what they’re talking about with the resulting blooming of a fast friendship. The only thing that’s predictable about the answers to this question is that they will uncover unexpected topics and unanticipated interest in some of these topics. Another benefit from this question is that often, people who describe their experience have no idea that others would find it valuable. What has been warming for me is to see how this discovery empowers these individuals. To discover that your peers value and admire your work in an area validates you professionally and personally. At a peer conference, such gifts are easily and frequently given. After The Three Questions, peer session sign-up has attendees visually document their wishes for the upcoming conference sessions. We then determine which of the suggested peer session topics are popular, and schedule the chosen sessions into a conference program. The whole process takes about an hour and can be held during an early conference social event. By creating a visual record of all attendee session suggestions, each attendee can be sure that their desires have been included in the group’s pool of topics, and the entire spectrum of possible choices is made available for all to see. The procedure is very simple. I set out, either taped or pinned on walls or laid on tables, multiple letter-size signup sheets like the one shown here. I ask everyone to use these sheets to write down descriptive titles of session topics that they’d like to attend and/or present. Only potential peer session topics are entered on the sheet at this stage. People can suggest as many sessions as they’d like, writing each one at the top of a separate sheet. They are encouraged to ask for anything they’d like to have happen, irrespective of whether they think it will be popular or not. Attendees are also told that they don’t need to duplicate a topic that someone has already suggested, but, if they have a slightly different idea for the session, they should write their own version on a separate sheet. At the end of peer session signup, attendees have a wall or tables full of session topics to review. Next we discover which topics are popular, and find attendee resources that will enable us to create feasible sessions on the subjects people want. To determine popular peer session topics we use a simple voting scheme. Attendees are asked to review all the topic sheets on display and sign their names under every topic title in which they are interested. I explain that signing their name doesn’t obligate them to attend any session, it simply will be used to indicate the degree of interest in each topic. I also use peer session signup to find out who might be able to help make the session happen. As people sign their names, they are asked to indicate if they could potentially help with the session—as a facilitator, as someone with experience or expertise in the subject, as a presenter or panelist, or as a volunteer scribe who will create a record of the session. They do this by placing an ‘F’ (facilitator), ‘E’ (experience/expertise), ‘P’ (presenter/panelist), or ‘S’ (scribe) next to their name on the relevant signup sheet. Discovering available resources for proposed peer sessions allows us not only to find people to lead sessions, but also to avoid scheduling peer sessions on popular topics that no one at the conference knows much about. 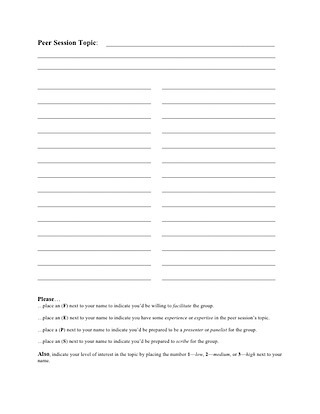 Once peer session signup is over we have almost all the information we need to choose and schedule sessions that meet the attendees’ expressed needs and wants. While peer session signup is going on, I assemble a small group of volunteers to create and schedule the peer sessions. I include people who are subject matter experts on the conference topic, so we can evaluate any obscure topics that people have proposed. Once signup is over, the volunteers retreat to a quiet location with plenty of table space where the signup sheets can be easily viewed, shuffled, and clustered. Before the conference begins, I draw up a preliminary schedule for the time allocated for peer sessions to take place. Over the years, I’ve found that assigning time slots of 45 -60 minutes works well for most peer conferences. Occasionally you may want to revise this schedule if a compelling session opportunity turns up; e.g. someone brings a long polished presentation that other attendees are anxious to hear. Normally you’ll want to have more than one peer session scheduled during each time slot. An exception would be if a suggested topic is so popular that just about everyone wants to attend the session, though this rarely happens. A very small conference might have as few as two simultaneous sessions, a larger conference as many as eight. Once you’ve decided on the maximum number of sessions you can start to chose the most popular viable topics. This diagram outlines the steps needed to determine which peer sessions will be held, and to schedule the resulting sessions. First, topics are scanned for overlap, low interest topics are removed from consideration, and the most popular topics (based on the number of signatures) chosen. After a final decision as to whether similar topics should be merged, the remaining topic sheets are checked to see whether the session is viable—are there attendees who are able and willing to facilitate and/or provide appropriate expertise? Expertise is not always needed, as discussion-oriented peer sessions often just require a competent facilitator. If a particular peer session requires specific attendees to be present, this is the time to ask them whether they will commit to being there. Most people are flattered to be asked, and happy to agree. If expertise is needed for a group but not available, then the topic is not scheduled. This rarely happens, but it’s important not to schedule a session that can’t be supported by peer experience. I usually announce this to attendees, so they understand why a popular session isn’t on the program. If the conference is a repeated event, the organizing committee may want to consider inviting an appropriate outside expert to a future conference. Once a final set of peer session topics has been chosen, scheduling them to specific time slots in the program is done essentially in the same way as a conventional conference. The topics are sorted into tracks, and each topic in a track is scheduled to a different time slot. One advantage over scheduling sessions at a traditional conference is that we have the signup sheets for each topic. By comparing the names signed up for each topic, we can schedule peer sessions to minimize attendance conflicts between simultaneous sessions. The last task is to assign each group a place to meet. This involves matching the popularity of the topic and any resources it may need, like whiteboards or digital projection, to the size and capabilities of the available locations. After the selected peer sessions have been scheduled in time and space, the schedule is printed and given to each attendee, and copies are posted around the conference site, including the places where attendees socialize and where peer sessions are held.